It seems almost silly to write a lengthy review of The Dogs of Camelot. If you are visiting this website, particularly if you come here often, you need to read this book in the same way someone studying American novels needs to read The Great Gatsby or someone studying film needs to see The Wizard of Oz. This is essential presidential pet reading. Filled with photos and anecdotes reaching back to John F. Kennedy’s childhood, Margaret Reed and Joan Lownds’ history is a warm portrait of a man who loved dogs (despite his allergies). Each White House-era canine is covered with his or her own chapter. We learn birth dates, breeders, how the Kennedy family acquired each pup, and everything important related to that dog’s life through the fall of 1963 and beyond. The authors spent countless hours sifting through archives at the Kennedy library, reading oral histories and notes. They also make good use of Dog Days at the White House, the classic memoir of JFK’s dog wrangler, Traphes Bryant. This legwork pays dividends. The Dogs of Camelot is, above all, a satisfying read. As Labor Day approaches and you try to squeeze in one more beach book, consider this page-turner. It overflows with history, good humor, and a strong love of dogs. If you’re here, you need it. Most biologists believe that Man’s Best Friend evolved over thousands of years from the gray wolf. For husky owners, the link might seem fairly obvious. Those of us with dogs who bear little resemblance to wolves might wonder why our wolf-descendants are so different from their ancestors. In the early 1950s, Soviet geneticist Dimitry Belayev decided to explore this question. He was in charge of breeding silver foxes for the lucrative state-run fur industry. Foxes do not like people. They bites. They run. They growl. Belayev’s idea was to selectively breed the calmest foxes to each other to see if, over time, the animals could be domesticated. How to Tame a Fox (and Build a Dog) chronicles six decades of research initiated by Belayev and largely overseen by his assistant, Lyudmila Trut, the book’s co-author. What Belayev and Trut discovered is that the hormones that regulate an animal’s response to humans can also change the appearance of a species over time. The experimental foxes not only began to wag their tails and seek human company, they also developed new coloration, shorter snouts, and floppy ears–all within decades of the experiment’s start. As a piece of pop science, How to Tame a Fox is well-written and easy for the layman to follow. It’s also full of Cold War history, political peril, and fascinating people (and animals). You may find yourself wishing you could travel to Siberia and return home with your own domesticated fox. President-elect Donald Trump has yet another “cabinet member” to nominate: first pet. That role may soon be filled by an adorable 9-week-old goldendoodle (golden retriever/poodle designer hybrid) puppy named Patton, according to The Washington Post. 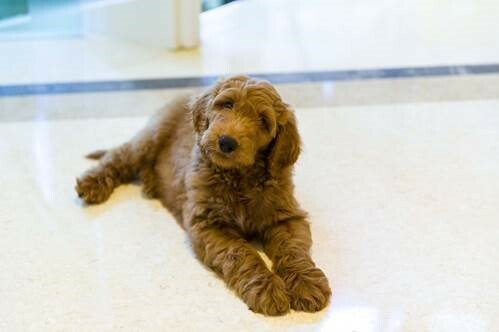 Lois Pope, a Trump booster from Florida, says she has offered to gift the puppy to Trump, and she’s confident the little doodle will canoodle with the next president soon enough. “I’m sure,” she told the Post. “He said, ‘Go over there and show it to Barron,’” Pope recounts of her Thanksgiving weekend conversation with Donald Trump at his Mar-a-Lago home in Florida. 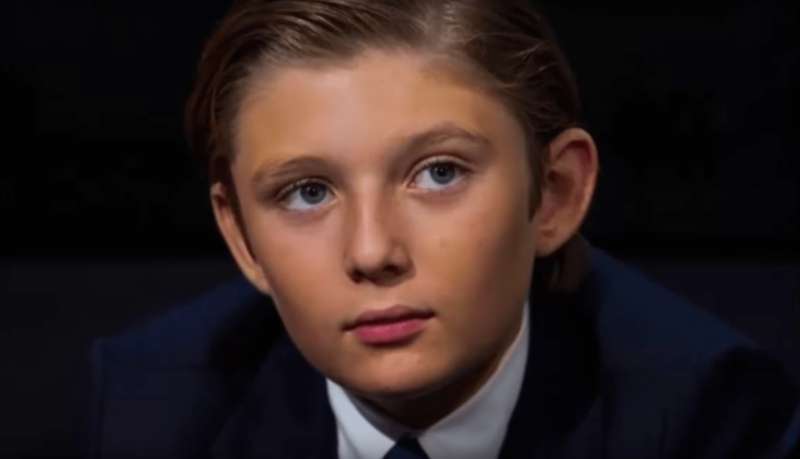 Barron is Trump’s 10-year-old son with wife Melania. A “big smile came over” the boy’s face, Pope says. Patton is named after the famous World War II general, whom Trump admires. Hope Hicks, a spokeswoman for the incoming president, says “no decisions have been made” about pets, according to the Post. Trump does not currently have any pets. Gifts of pets are quite common for U.S. presidents. Even if Trump does accept the puppy, it’s not known whether the cute ball of fur would be joining him at the White House. Melania and Barron are planning to stay in New York City through at least the spring of next year, so it’s possible Patton would stay with them at Trump Tower. Regardless, Pope is convinced the puppy will ease Trump’s transition to the presidency — even though the pooch still needs to be house-trained. A recent visit to the White House turned into a Q&A session as First Lady Michelle Obama left White House staff members’ kids with a greater appreciation for the role that pets play in our lives. The children were there in honor of Take Our Daughters and Sons to Work Day. The topic of conversation quickly turned to the current four-legged residents, Bo and Sunny. 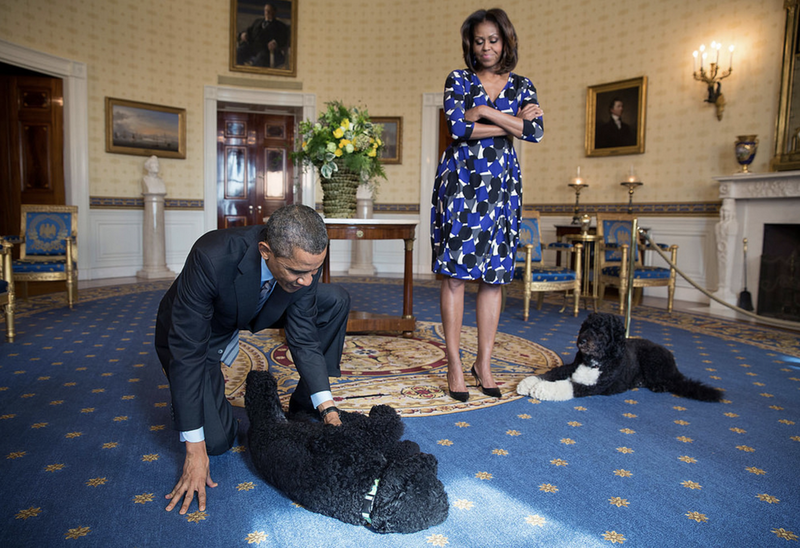 Bo, 7, and Sunny, almost 4 — both of whom are Portuguese water dogs — have lived a life of canine royalty at 1600 Pennsylvania Ave. Among their most notable events are being introduced to R2D2 of Star Wars fame and the pope. When one boy asked Mrs. Obama, “What’s your favorite thing to do with your dogs?” the First Lady’s response brought chuckles from the other youngsters. “Just squeeze them,” she said, adding that the dogs could do just about anything they wanted — sit in her chair or on her lap, or just cuddle with her. Making Bo and Sunny run and chase each other gets them moving and is a joy to watch, according to Mrs. Obama. She also shared her belief in why the two dogs love her so much: She gives them great massages. Tricks? They Know a Few. Another question, asked by a young girl, was if the dogs knew any tricks. The answer of “yes” brought more smiles from the excited faces in the crowd. Michelle Obama conceded that even though both dogs know a few tricks, Bo knows the most. Keep in mind, he’s the oldest. They will both heel, sit, or stay on command, with Bo even rolling over or speaking and giving a high-five. Sunny is an eager learner who just needs a little more one-on-one training. One thing’s for certain: These pets know they’re loved — and with Michelle Obama’s Let’s Move! campaign, their future probably includes lots of walks and playtime. What better way to have fun with pets than spending quality time with them?